← What’s Obama Done for us Lately? Wayne opened Holy Roast Coffee about three years ago. A lot of coffee places, including my sentimental favorite, Wolf Coffee, were closing at that time, so this seemed like a leap of faith. I think the leap has been rewarded. 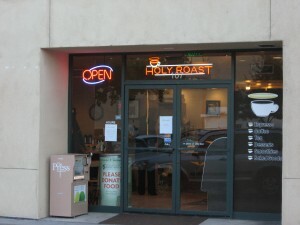 Holy Roast is located on Mendocino and Seventh in Santa Rosa, directly behind the Subway sandwich place. The shop is very clean and at first I thought it looked too modern to be a true “coffee house.” I was wrong. In this clean corporate space beats the heart of a gathering place, a social center. Two things endear Holy Roast to me; their mocha drinks, and their staff. I don’t know exactly why, but for me, they make the best mocha around. The proportion of chocolate to coffee is right, meaning you can taste coffee, not just chocolate, and they use a darker chocolate powder, so it’s not overly sweet—it’s got the smoky bite to match the coffee. The staff is wonderful. Denise, the blond woman who worked mornings (and is now the owner) was always efficient and friendly. When, once in a great while, I’d go over in the afternoon, the young woman with the sleeve tattoo was always friendly and accurate. On the even rarer occasions when I head downtown during the weekend, the weekend staff are welcoming and friendly. I have never had my order go wrong at Holy Roast, something I can’t say for Peet’s. Holy Roast is the only place I’ve been that posted written tips about ways to avoid leakage from your plastic lid, as if they cared that you might scald yourself or dribble coffee on your dry-clean-only blouse or suit. The second holiday season Wayne was open, he brought a tray of pastries over to our office one day a few days before Christmas. They were free. He was going to have to throw them away before the holiday anyway, but rather than do that he batched them up and walked them over to an office that held a lot of his customers. Just a little initiative and neighborliness. Another time the block suffered one of its many power failures. I was coming across the street under the dead stoplights and there was Wayne, standing on the corner by his building, handing out free drink cards. Sure, he could have waited behind the counter and let people cling to their false hope that maybe there was power and coffee a few seconds longer, but again, he took some initiative. He knew his neighborhood. The Santa Rosa motorcycle cops frequently stop there for coffee. Some mornings, Wednesdays, I think, a small bible-study group gets together there. Other mornings, three or four men my age, with flannel shirts and guitars, show up and practice James McMurtry tunes. Just a few months ago, two weeks shy of her two-year anniversary as an employee, Denise bought the shop from Wayne. She has added more lunch-type foods. The cheerful, efficient service is unchanged. She has created some evening events—knit and crochet on Tuesdays (she’s the only crochetter, she says), and open mike on Fridays. Some friends are bugging her to start a book club night. That’s fine, she says, she’ll keep the place open as long as she’s not expected to choose the books. She’s just too busy. Holy Roast looks like a fine place for a mini Write-In during Nanowrimo. 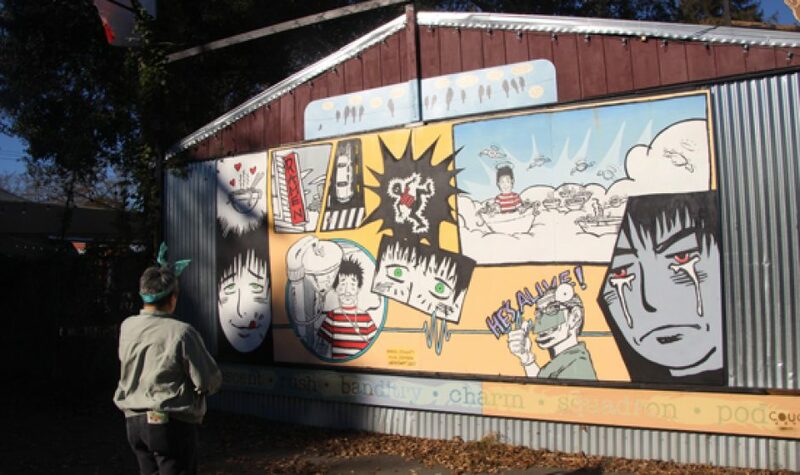 There’s a lesson here about location, and having a business plan, but also about heart. Holy Roast has a heart. It’s a place to get a good mocha, and feel welcomed. This entry was posted in View from the Road and tagged coffee, Holy Roast, mocha, open mike night. Bookmark the permalink.